On January 16, the Nebraska Concrete Paving Association (NCPA) recognized the winners of its esteemed Concrete Paving Award as part of the organization’s 39th annual Concrete Paving Workshop. Amongst the winners were two JEO transportation projects for Dakota City, NE, and Broken Bow, NE completed in the 2017 contract year. 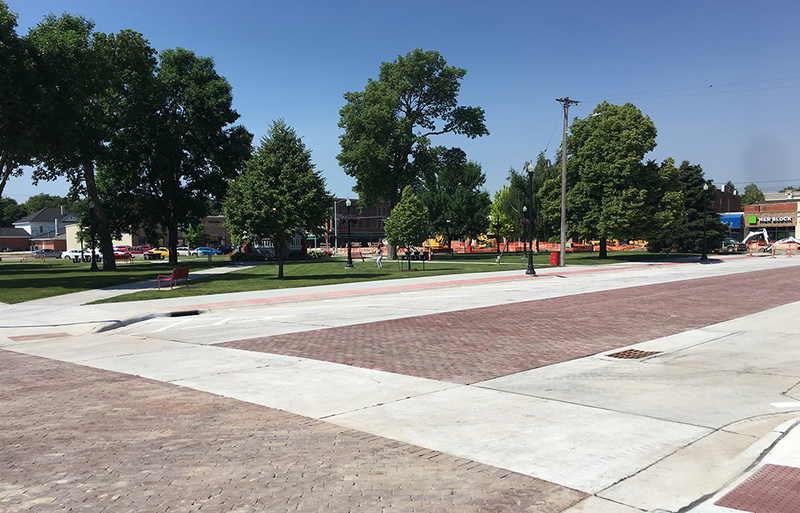 Concrete Paving Awards were received in the Urban Streets category and the Local Projects of Less Than 30,000 SY category for the design and construction of downtown square improvements in Broken Bow, NE, and street paving in Dakota City, NE respectively. “When others recognize the work, it provides a sense of validation, for both ourselves and our clients, that the effort was worth it,” said Project Manager Jonathan Marburger, reflecting on the accomplishments of the team. The Concrete Paving Award celebrates the best Portland Cement Concrete projects designed and constructed each year. Projects are evaluated by a panel of NCPA members and other significant representatives for pavement innovation, complexity, smoothness, level of quality control, contractor management, safety, and aesthetics. 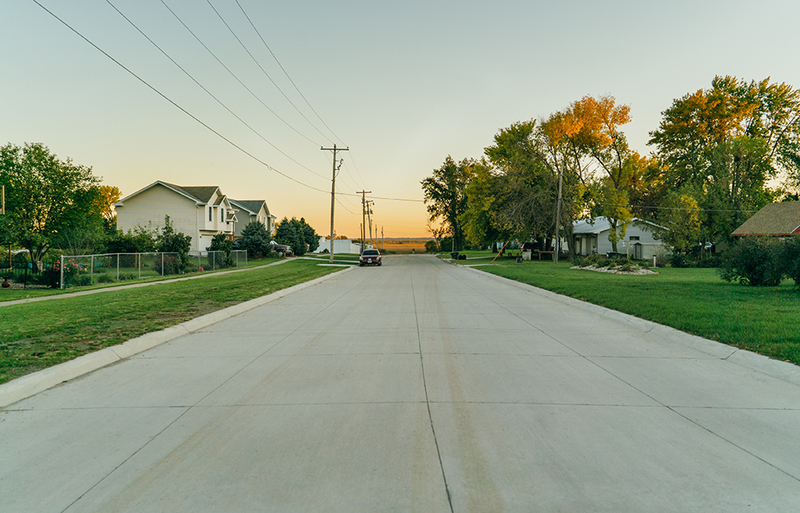 Up until 2017, nearly 130 blocks of Dakota City’s streets were gravel. For years, the costly and difficult-to-maintain roads had residents contending with rutted surfaces that kicked up dust during dry periods and became muddy after it rained. This problem persisted until April 2016, when they issued a public notice that identified 18 paving districts, mainly individual city blocks, in need of updates. Property owners along these streets then voted in favor of funding the paving of nine of the districts identified, allowing the project to move forward. With the help of JEO Transportation engineers, an additional four blocks, adjacent to the city-owned property and brand-new fire station, were also incorporated into the design, bringing the total of paved streets to 13. The existing gravel streets were replaced and the project was completed three months ahead of schedule. Best of all, getting around town became easier, rain or shine. Marburger feels that the project’s success was the result of effective planning and implementation from JEO, the city, and contractors. “A proactive and conscientious contractor and a good working relationship are paramount to the implementation of project plans,” he says. Broken Bow’s downtown square is the center point, staple, and key attraction of the community. Some aspects of the square, such as the bandstand, are more than 100 years old. Unfortunately, due to age, some of the square’s features needed updating, a priority not only for the city administrator but also many Broken Bow residents. The city’s motto, “rooted, but not standing still,” encompasses the city’s goal to honor its history while still progressing into the future and providing the community with safe and current downtown amenities. With the help of our Transportation team, Broken Bow developed a three-phase plan to renovate the square and surrounding areas. The streets of the square itself would retain its historic relevance by removing and replacing three blocks of the brick pavers that had been laid in 1921. A new concrete base, acting as a driving lane, was constructed alongside the pavers. The plan also included adding concrete parking, sidewalks, decorative lighting, water main and service lines, and ADA ramps. Phases two and three provided concrete revamping to the streets, parking, sidewalk, and ADA accessible ramps, directly adjacent to the square. Additionally, a bike trail was incorporated from 10th to 14th street, along south B street. Thanks to the downtown improvements made to Broken Bow’s iconic square, the community will continue to enjoy the historical beauty—with modern qualities—for the next 100 years.